Born in 1847, Cartier is the most famous jeweler of the Place Vendome. The one of excess, of the Arabian nights tales, of Russian and Chinese emperors, of colored stones, of the first wristwatch, … In a nutshell, THE jeweler. 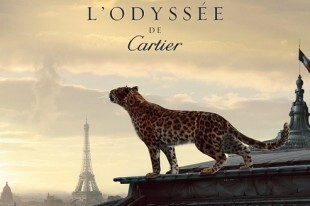 To celebrate its rich history and its 165 years, the brand has created an exceptional movie: L’Odyssée de Cartier. Led by the fetish-animal of the house, the panther, the viewer enters in the legend, by browsing the banks of the Neva and the Hermitage Museum, the Great Wall of China, the palaces of the Maharajas, the travel of Santos-Dumont, the Grand Palais and finally the Place Vendome, where everything starts and finishes. The 3m30 film gives pride to the most mythical objects of the house: the Santos watch (1904), the Tank watch (1917), the Trinity ring (1924) or the band Love (1969). It required two years of work, 50 people and 4 million euro budget, directed by Bruno Aveillan. It will be broadcast in 29 countries around the world and absorb 5 to 10% of global communications brand budget. The device launch in France was held on Sunday, March 4, on TF1 where for the first time in history, a mark held entirely ad space between TF1 newshow and the Sunday night movie. A marvel to watch again and again, that opens the myths and legends of the most famous jeweler in the world. This entry was posted in For Your Eyes Only. Bookmark the permalink.